Copyright Solar Partners Co. All Rights Reserved. 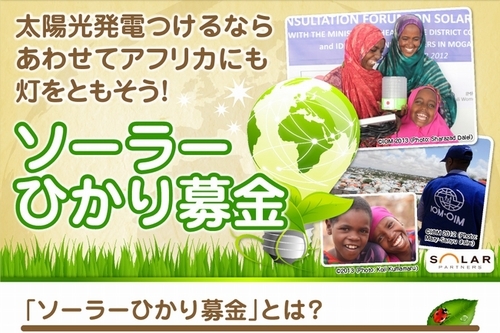 Solar Partners Co., a Japanese company operating a network of solar power installation businesses, announced on September 17, 2013, that it started a joint project with the International Organization for Migration (IOM) to donate solar lanterns (solar-powered lamps with rechargeable batteries) to people in Somalia who have no access to electricity. The aim of the project is to donate 1,000 solar lanterns. The project is part of an effort by Solar Partners and IOM to reduce sexual violence, such as rapes, in Somalia. The country, which has been in a state of anarchy for more than 20 years since a civil war began in 1991, is said to be the most dangerous country in the world. It is also said that Somalia ranks the worst in the world in terms of sexual violence. Since many sexual violence cases occur at night, it is expected that the donated lamps will help reduce their frequency. From September 1, 2013 to March 31, 2014, Solar Partners will support IOM by donating a sum of money equivalent to one solar lantern for each installation of a solar power generation system and for every ten requests it receives for an installation quote.